Don Travis: How About Another Prologue this Week? Last week we had a short piece from an unpublished novel. Today, I’d like to give you the Prologue of another one entitled SOURWATER SLOUGH. It takes place in my old neighborhood of Southeastern Oklahoma. And speaking of Oklahoma, let’s take a moment to remember the tragedies of that great state’s recent super tornadoes. By the way, the protagonist in this book (whom we will not meet in the prologue) unexpectedly finds himself a brand new Malcolm County Deputy Sheriff—after spending most of his teen years being a thorn in the Sheriff’s side. How he got there’s an interesting story in itself. Tishomingo Echo Hawk is a cool, woman-chasing, hard-drinking Choctaw not yet twenty-one whose tenuous tie to the native community is a sassy, no-nonsense grandmother who outsmarts him every time. He dislikes the way his mother selected his given name, so he goes by the moniker of Mingo. Here’s the start of his story. Enjoy. The girl tossed her head and looked at the pickup sitting thirty yards away on high ground. Her long black hair rustled like silk. That hair was what he liked most about her. Along with her eyes. He wagged his eyebrows suggestively and immediately felt like a fool. “Looking for a little privacy. You know, to have some fun.” He shifted his weight. His boots slipped in slimy mud. Why had he chosen this spot? Maybe to get her goat. No, that wasn’t it. He liked the place, probably because no one else did. He inhaled the fetid air like perfume. He tugged on her slender arm. She stumbled backwards, scrambling to maintain her balance. Thin-soled slippers lost traction in the goop. She went down with a muted cry, slamming into the bole of a tree. She dropped and lay like a rag doll. He swayed over the inert body, drawing sharp gasps. The rage dissipated. His hands dangled at his sides, fingertips twitching. His hammering heart rate slowed abruptly, leaving him dizzy. Reality returned in the faint drip of water somewhere nearby; in the smear of blood on the rough, curling bark of the tree; in the rank stench of the swamp. A stultifying breeze ruffled his face. He’d just wanted to get it on, to do it. That’s what they’d come out here for—or he had, anyway. Wasn’t like they hadn’t done it before. Why’d she have to go squirrelly? It wasn’t fair. Got him all hot and bothered and then crapped out on him. She couldn’t get away with that. His shoulders rose and fell with a sigh. She was usually a good sport, up for doing crazy things. He’d led her away from the truck on purpose, laughing at the awkward way she skied through the mud. How was he supposed to know she’d get mad? God, she looked funny lying there. Too bad, but she ought not have treated him like dirt. His words echoing hollowly across the dead surface of the slough spooked him. Didn’t sound like his voice. More like a stranger’s. Was somebody in his head talking for him? A splash down the shoreline sent his heart pumping and puckered his flesh. He peered through the late afternoon haze. Fishermen? Frog giggers? But nothing stirred in the oppressive heat. Not a leaf. Just swarms of gnats and flies. Sourwater lay silent and mysterious, looking more like a pool of dirty motor oil than water. A thick canopy of branches overhead almost obscured the low bank of clouds hiding the sun. The heavy atmosphere made it hard to breathe. The bog reeked of death and decay. What the hell was he gonna do now? Ripples near a cypress knee poking up out of stale water turned into a snake. The sight of the ugly moccasin gave him an idea. Nobody knew he’d brought her out here. So he’d just leave her for the swamp. Fish ate dead flesh, didn’t they? Better yet, his great-granddaddy used to tell about a big alligator down in the bottoms. That dude would take her for sure. Clean up after him in a minute. Nobody’d ever find her. That was the answer. The slough knew how to take care of its dead. A clap of thunder overhead and an answering rumble off to the south freed him from inertia. He slogged through the mud to his vehicle in search of something to weigh her down. Rope was no good—too distinctive. All kinds of killings got solved with nothing more than a hair. He knew that from watching TV, although Buchanan and his Malcolm County crew weren’t as sharp as those guys on “CSI.” They wouldn’t catch him like that. Not those slobs. Still, he needed to be careful in case they called in professionals—like the state cops. A spool of fishing line might work. Everybody in the county had a reel, and it wouldn’t take fingerprints. What was that other stuff they talked about on those shows? Skin thing-a-ma-bobs. Epi—epi-something-or-the-other. The nylon was too smooth to hold anything like that, but just to be safe he’d wear a pair of work gloves from the pickup to handle everything. He stripped to keep sweat from ruining his clothes. 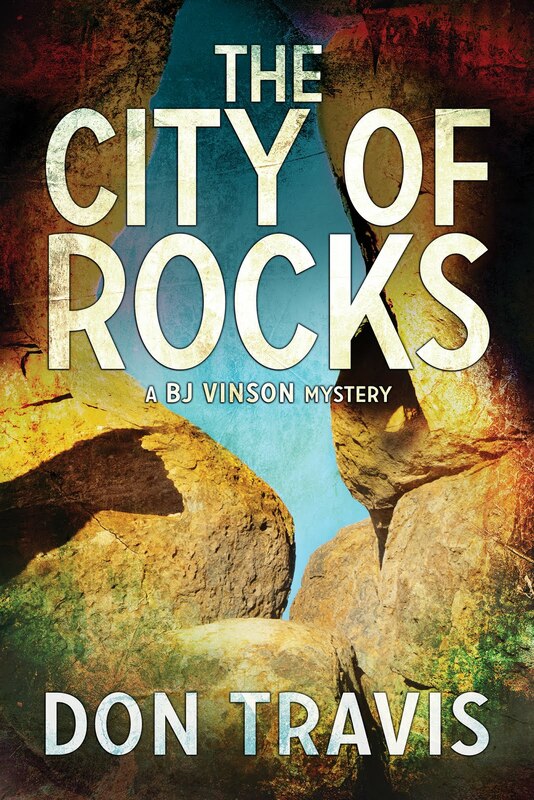 Buck naked, he scrounged enough rocks to fill two burlap sacks he found along the shoreline. Panting from his efforts, he lashed the frail, dead form to the bags with yards of filament. Man, even that thick hair looked different now. Lost its luster. As he struggled to lift the trussed up package, he slipped and fell on his face. He fought his way to his feet as the first raindrops crashed through the overhanging branches. When he rolled her into the slough, she slid a couple of feet and stopped. He recoiled as her big eyes stared at him. He swiped his running nose and steadied himself. It was just the water. The weighted sacks had caused her to turn in the shallows. She wasn’t looking at him. She wasn’t looking at anything. He forced himself to wade into the revolting stew of sediment and noxious ooze to struggle with the bundle, all the while trying to ignore thick muck squishing between his toes and clutching his ankles like spectral hands. Oh, hell. Where was that water moccasin? It was all he could do to keep from bolting back to the shore. Fat raindrops raised pimples on the dark water, making it seem alive. Green at the edges, the lagoon turned black toward the middle. Poisons leaching up out of the ground. Acids eating his flesh right now. 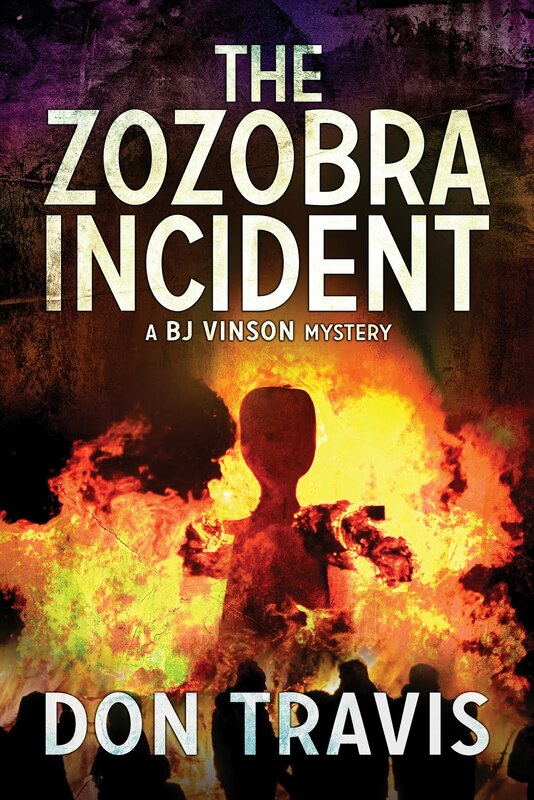 He grabbed the body before he freaked himself out and heaved with all his strength. His feet shot out from under him. He went down hard in the slick mud. The girl seemed to clutch his chest. With a mindless squeal, he shoved her away and scrambled to find purchase on something solid, but the slimy bottom betrayed him. He floundered helplessly as Sourwater sucked him into her depths. He fought his way to the surface, splashing like a five-year-old who couldn’t swim. Reason returned, but not before he’d taken a lungful of filthy water. Coughing and gagging, his insides burning, he clawed his way back to shore to throw up on the muddy bank. While he struggled with his heaving stomach, a brilliant bolt of lightning struck a tree across the lagoon. Ear-splitting thunder left his head swimming. A sharp odor filled his nostrils. He tasted ozone on his tongue. His hair stood on end, and his nerves sang like they were plugged into a live socket. That had been close. He threw up his head and laughed. 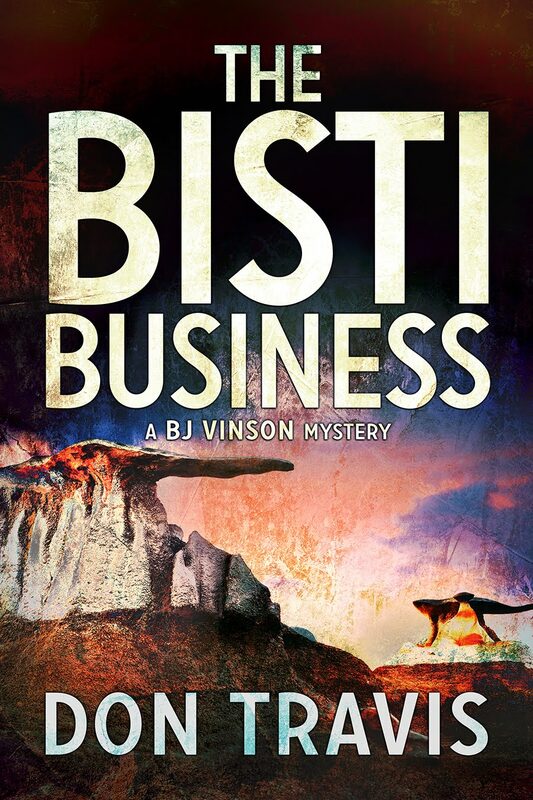 Next week: I'll try to get back to THE BISTI BUSINESS. After all, we haven't visited Bisti/De-Na-Zin yet.